In this work the use of polyurethane chemical recycling product (i.e. glycolysis of polyurethane waste realized with the mass excess of polymer) as a plasticizer for natural rubber-based composites was proposed. The effect of plasticizer type (napthenic oil and polyurethane foam glycolysate) and amount (2, 4, 6 or 8 parts per 100 parts of natural rubber) on the processing properties of rubber mixtures and chemical structure, swelling, mechanical and thermo-mechanical properties of natural rubber/carbon black composites was investigated. The effect of applied plasticizer was studied in the context of accelerated thermal aging (thermo-oxidative aging) which was applied for the prepared natural rubber-based composites. The obtained results confirm that the polyurethane foam glycolysate can be successfully used as a plasticizer for the preparation of natural rubber composites. Moreover, it was found that glycolysate acts as a vulcanization accelerator and reduces decreasing of mechanical properties during the accelerated thermal aging. Plasticizers are especially required for the preparation of rubber mixes with fillers using two-roll mills, calenders or mixers. Their role is connected with increasing of rubber plasticity, which permit to obtain uniform dispersion of ingredients in the rubber matrix. The time of mixing and energy required for the process is lower due to application of plasticizers. The molecules of plasticizers penetrating between rubber molecules and changing the arrangement of the rubber chains in the space and changing interactions (cohesive forces) between the macromolecules. This phenomena affects also the mechanical properties of obtained vulcanizates. Generally introduction of plasticizer in the rubber network results in decreasing of tensile strength and hardness, while elongation at break and elasticity increasing [1, 2]. In some applications (when the working temperature of elastomer part is relatively low) the addition of plasticizer is connected with the decreasing of glass transition temperature, which permit to extend the working temperature range [1, 2, 3]. Oh and co-workers investigated the influence of selected plasticizers [i.e. dioctylphthalate (DOP), tricrecylphosphate (TCP), dioctyladipate (DOA), parafinic oil (PO) and aromatic oil (AO)] on the freezing resistance of natural rubber and polybutadiene rubber vulcanizates. The rubber material for freezing resistance applications (e.g. aero tires or air spring of express trains in railways) should have low Tg, so the amount of plasticizer should be relatively high. The decreasing of the glass transition temperature were observed only as the amount of DOP and DOA increasing . In the rubber industry the mineral oils (paraffinic, napthenic and aromatic oils), microcrystalline and paraffin waxes, fatty acids (e.g. stearic or oleic oil) or cumarone-indene resin are commonly used as plasticizers for the natural rubber and synthetic [1, 2]. Nowadays, in accordance to the green chemistry trends the special interest is put on the monomers, polymers and additives derived from the renewable resources. In the area of rubber technology the special place is occupied by bio-based additives like fillers, antioxidants or plasticizers [4, 5, 6, 7, 8]. Peliizzari and co-workers investigated the novel bio-based plasticizers obtained from vegetable oils (commercialized under the tradename Matrilox®). It was found that bio-based plasticizers can be successfully used for the preparation rubber compounds (based on NR, BR, SBR and NBR, SBR) as partial or total substitutes of traditional plasticizers . Wang and co-workers proposed palm oil (PMO) as a green plasticizer for the ethylene propylene diene monomer (EPDM) rubber and investigated the processing and mechanical properties of obtained materials. The obtained results indicated that PMO can be a cost-effective green plasticizer, which could replace petroleum-based paraffin oil for EPDM rubber processing due to similar processing properties of rubber compounds and mechanical performance of final materials . Alexander and Thachil proposed cardanol as a plasticizer for the preparation of natural rubber/carbon black composites and investigated. The cardanol can be derived from the cashew nut shell liquid, which is an agro-byproduct. It was found that vulcanizates obtained using cardanol as a plasticizer possess similar tensile properties, shorter cure times, and improved ageing stability in comparison to petroleum-based aromatic oil . The plasticizers are also required for other polymers like poly(vinyl choloride), poly(ethylene terephthalate), several polyolefins, poly(lactic acid), polyhydroxyalkanoates or thermoplastic starch [11, 12, 13]. The special interest is focused on the effective, environment and human health friendly plasticizers for poly(vinyl chloride), which is connected with the toxicity of the commonly used phthalate-based plasticizers . In accordance to the literature several bio-based plasticizers for PVC processing are still proposed, for example castor oil based polyol esters , epoxidized glycidyl ester of ricinoleic acetic ester , acetylated lactic acid 1,4-cyclohexanedimethyl ester . The glycolysis of polyurethane waste can be realized by two ways. The first one is focused on the polyol recovering and this method is realized with the mass excess of the low-molecular weight chain extender. The resulted glycolysate contains two phases and need purification, and after that recovered polyol can be used for the synthesis of polyurethanes. The second one is connected with obtaining product terminated mainly by hydroxyl group, but urethane moieties are still presented in the chains of glycolysates. This kind of glycolysis is performed with the mass excess of polyurethane waste. The glycolysates obtained by this way can be directly (without any purification) used in the synthesis of new materials, i.e. polyurethane foams or elastomers [18, 19]. The polyurethane glycolysates (obtained by glycolysis process realized with the mass excess of polyurethane waste) were also successful applied as plasticizers for the preparation of natural rubber vulcanizates, i.e. natural rubber/titanium dioxide  and natural rubber/silica composites . In the case of mentioned natural rubber composites the glycolysate-based plasticizer was used at constant amount. The effect of glycolysate amount (used as a plasticizer) on the chemical structure, swelling properties and mechanical performance is not described in the literature. It should be also pointed out that polyurethane glycerolysates (obtained by glycerolysis of polyurethane waste with the mass excess of polymer) was successfully applied as a plasticizers for the preparation of natural rubber/lignin composites [22, 23]. The main aim of presented work was to study the effect of polyurethane glycolysate, used as a plasticizer for natural rubber mixtures, on the chemical structure (by FTIR method), swelling properties, selected mechanical properties (i.e. tensile properties, hardness) and thermo-mechanical properties (by DMTA method) of natural rubber/carbon black composites. The obtained results were compared with the results obtained for the vulcanizates prepared using naphthenic oil (Nytex 810) as a plasticizer. Moreover, all prepared samples were aged in the air atmosphere at 70 °C for 7 or 14 days (thermo-oxidative aging), which permit to investigate the effect of applied plasticizer on the performance of the prepared composites during accelerated thermal aging. The natural rubber and ingredients like stearic acid, zinc oxide, stabilizer IPPD (N-isopropyl-N’-phenyl-p-phenylenediamine), accelerator T (tetramethylthiuram disulphide, TMTD) and sulfur were supplied by Guma Pomorska (Poland). The napthenic oil Nytex 810 (Nynas, Poland) or polyurethane foam glycolysate (Gdańsk University of Technology, Poland) was used as a plasticizer. Carbon black N330 (Toremiex-Chemicals, Poland) was used as a filler at constant loading equal 40 parts by weight per 100 parts of natural rubber. The rubber mixture formulations are given in Table 1. The glycolyste, used in this study as a plasticizer, was obtained by glycolysis of polyurethane foam using 1,4-butanediol and potassium acetate as a catalyst. The scheme of the reaction is presented in Fig. 1. The weight ratio of polyurethane waste to low molecular weight diol was equal 6:1. The reaction was performed at 200 °C for around 1 h. The resulted product was a dark-brown liquid with hydroxyl number 202 mg KOH/g (and average molecular weight 533 g/mol). The mixtures of natural rubber and mentioned earlier components were prepared on the laboratory two roll mill during 20 min. The ingredients were added in sequence presented in Table 1. The addition of each subsequent component follows good distribution of the earlier component. The rubber mixtures were vulcanized by compression molding using a hydraulic press at 145 °C with a pressure around 4.5 MPa at the time in the range from 8 to 10 min. The proper time of vulcanization was evaluated on the basis of vulcametric measurements. The all prepared vulcanizates were subjected to accelerated thermo-oxidative aging in air atmosphere at 70 °C for 7 and 14 days. The samples were aged in the form suitable for further testing, for example the samples for the static tensile test were in a standard dumbbell shape. The chemical structure of polyurethane glycolysate and obtained natural rubber/carbon black composites was verified using Nicolet 8700 FTIR Spectrophotometer (ThermoElectron Co.), and 64 scans was taken between 500 and 4000 cm−1, with the resolution of 4 cm−1. Tensile properties—including tensile strength (TSb), elongation at break (εb), and modulus at 100% (M100%), 200% (M200%) and 300% (M300%) elongation—were measured using a universal testing machine Zwick/Roell Z020 (Zwick, Germany) according to ISO 37. The cross-head speed was 200 mm min−1. The obtained results are averages from five independent measurements and samples for the test were prepared in a standard dumbbell shape (with average width 5 mm and average thickness 2 mm in the measuring length). Hardness (H) was determined using an electronic Shore type A (Zwick, Germany) according to ISO 868 standard. The presented results are averages from random five points in one specimen with the thickness around 8 mm. Dynamic mechanical thermal analysis (DMA) was carried out using a DMA Q800 analyzer (TA Instruments, USA) in a temperature range from – 100 to + 150 °C. The measurements were performed at operating frequency 1 Hz and heating rate of 4 °C min−1 under air atmosphere in the three-point bending mode. The dimensions of the samples for the test were 10 mm × 40 mm × 2 mm. The temperature dependence of storage modulus (E’), loss modulus (E’’) and tangent delta (tan δ) was determined. The equilibrium swelling method (using the Flory–Rehner relationship) was applied to determine the crosslink densities (ν) of the prepared natural rubber-based composites. The other swelling parameters, i.e., swelling ratio (SR), volume fraction of the rubber network in the swollen phase (Vr) and average molecular weight of the polymer between cross-links (Mc) were also determined and presented. The test method and determination of all mentioned parameters is the same as presented in our earlier work . Measurements was realized in toluene (the Flory–Huggins natural rubber–toluene interaction constant is equal 0.38) and obtained results are averages from three independent tests. The influence of plasticizer type and amount on the vulcanization process parameters of natural rubber mixtures are presented in Table 2 and Fig. 2. The amount of used plasticizer is not affecting the value of minimal torque (ML), which indicates similar processing properties of investigated natural rubber compounds. The ML values was higher for the rubber mixes plasticized using polyurethane glycolysate. It was also observed that maximal torque (MH) values decreasing with increasing amount of plasticizer and higher values of mentioned parameter was observed for the NR mixes prepared using naphthenic oil. The maximal torque is related to the stiffness and shear modulus of vulcanized compounds [25, 26, 27]. The higher stiffness of natural rubber/carbon black composites prepared using naphthenic oil is resulted from the decreasing mobility of polymer chains, which is in good correlation with the results from the static tensile test (higher tensile strength and lower elongation at break) in comparison to the composites obtained using polyurethane glycolysate as a plasticizer. The difference between maximum and minimum torsion moment (ΔM) decreasing with increasing amount of the plasticizer. The values of ΔM are connected with the cross-link density of vulcanizates and higher values of cross-link density are observed for the materials obtained using naphthenic oil as a plasticizer, which are characterized by higher values of ΔM. The optimal vulcanization time depended on the amount of used plasticizer. 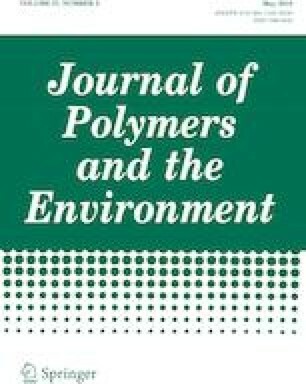 The values of the t90 increasing with the increasing content of plasticizer and higher values of this parameter were observed for the natural rubber mixes plasticized using polyurethane glycolysate. In the case of the natural rubber mixes plasticized using naphthenic oil the scorch time increasing slightly with the increasing amount of plasticizer—from 2.94 min for NRC2O to 3.12 min for NRC8O for NRC8O, while for the NR mixes plasticized using polyurethane glycolysate significant decreasing of t2 is observed with increasing amount of this additive—from 2.51 min for the NRC2G to 1.49 min for NRC8G. 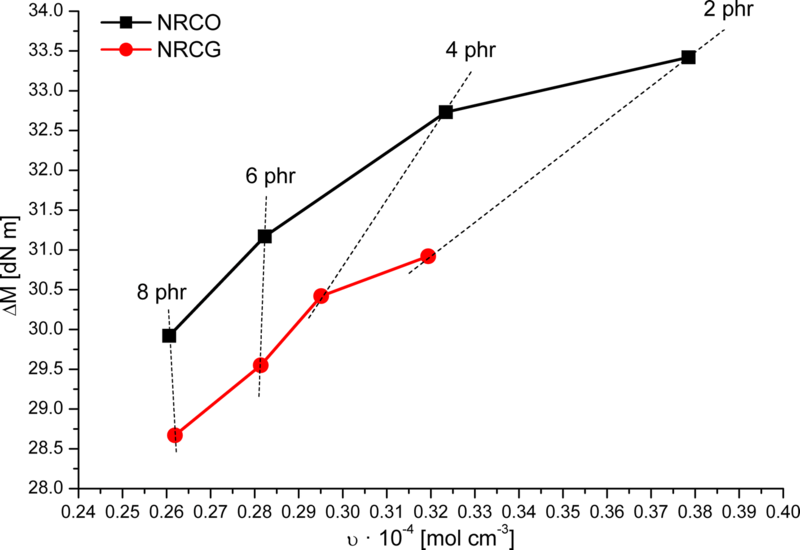 The observed trend resulted in the significant decreasing of curing rate index (CRI) for the NR mixes plasticized using polyurethane glycolysate—from the 46.9 min−1 for NRC2G to 27.1 min−1 for NRC8G. It can be resulted from the fact that glycolysate can act as vulcanization accelerator due to presence of the urethane groups in the chemical structure of glycolysate chains (the glycolysis process was realized with mass excess of the polyurethane waste). The FTIR spectrum of polyurethane glycolysate used in this study is presented in Fig. 3. The absorption band at 3361 cm−1 is connected with stretching vibrations of N–H groups (presented in urethane bond), while the board band in the wavenumber range from 3100 to 3600 cm−1 coming from the stretching vibrations of hydroxyl groups presented at the ends of glycolysate chains. Intensive absorption bands observed at 2800–3000 cm−1 correspond to symmetric and asymmetric stretching vibrations of methylene units. The stretching vibrations of carbonyl groups (C=O) presented in urethane bond are visible as bands at 1726 cm−1. In the region between 977 and 1197 cm−1 the double peak (with the maximum at 1092 cm−1) is observed, which corresponds to stretching vibration of C–O–C. The assignment of bands presented in FTIR spectrum of polyurethane glycolysate to vibrations of corresponding chemical groups was made using data presented in the literature, including own results [20, 28, 29]. 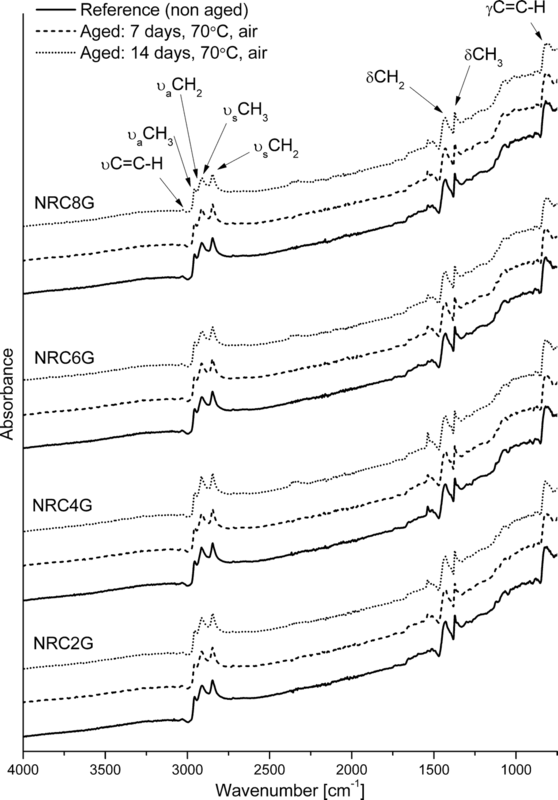 The FTIR spectra of non-aged (reference) and aged (70 °C, air atmosphere, 7 and 14 days) natural rubber/carbon composites prepared using naphthenic oil (Nytex 810) and polyurethane glycolysate as a plasticizer are presented in Fig. 4 and Fig. 5, respectively. For all samples the similar spectra were recorded. The bands assigned to methyl and methylene symmetric and asymmetric stretching vibrations are visible in the wavenumber range from 2800 to 3000 cm−1. The stretching and out-of-plane bending of =C–C–H units are visible as bands with the maximum at 3031 cm−1 and 830 cm−1, respectively. The bands with maximum intensity at 1371 cm−1 and 1431 cm−1 correspond to the bending vibrations of methyl and methylene units, respectively. The band at 1538 cm−1 corresponding to the stretching vibration of carbonyl group in zinc stearate, which is an accelerator of vulcanization process [30, 31]. The intensity of mentioned band increasing with increasing time of aging and it is connected with the post-curing effect. Zinc oxide and stearic acid was used to prepare rubber compounds and during the preparation and vulcanization process zinc stearate (vulcanization activator) is formed. Increasing intensity of band at 1538 cm−1 indicates that during accelerated thermal aging zinc stearate is still formed. 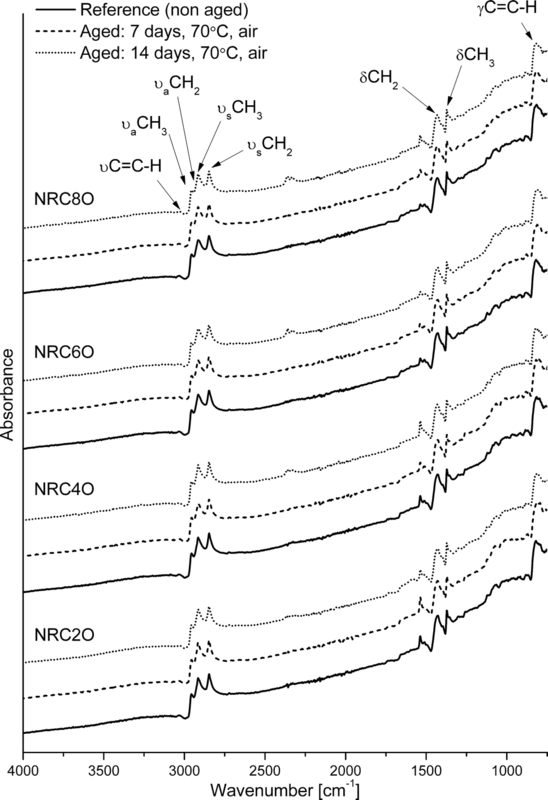 The assignment of other bands presented in FTIR spectra of NR/carbon black vulcanizates to vibrations of corresponding chemical groups was made using data presented in the literature . 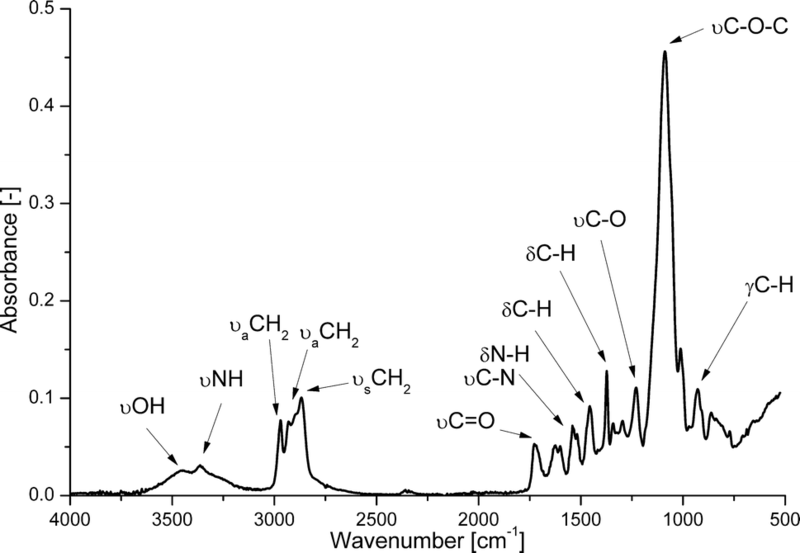 The main changes after thermo-oxidative degradation of natural rubber (polyisoprene) vulcanizates cured using sulfur-based convention systems are generally observed in the FTIR spectra as changes of bands at 835 cm−1 (=C–H out of plane bending) and 1710 cm−1 (C=O stretching vibrations) [33, 34, 35]. In the obtained results the evidences of thermo-oxidative degradation of prepared vulcanizates (during accelerated thermal aging) are not visible. It can be resulted from presence of the antioxidant in the obtained vulcanizates, i.e. 1.5 parts of N-Isopropyl-N’-phenyl-p-phenylenediamine (IPPD) per 100 parts of natural rubber in each compound. Moreover it was found that during the accelerated thermal aging of vulcanizates post-curing effect occurs. This phenomena is connected with increasing of cross-link density and will be discussed later. The swelling properties of prepared natural rubber/carbon black composites are summarized in Table 3. Generally swelling ratio increasing (higher amount of solvent is absorbed by rubber network) with increasing amount of the plasticizer, which is resulted from decreasing of cross-link density. Moreover swelling ratio decreasing (cross-link density increasing) with increasing time of aging, which is connected with post-curing effect (Fig. 6). The post-curing effect tends to increase with increase of aging temperature and is observed for natural rubber vulcanizates cured using conventional systems [36, 37]. The addition of antioxidant (IPPD in this work) probably makes that the post-curing of material is faster than degradation of rubber network. The bond energy of C–C bonds (346 kJ mol−1) is higher than that of C–S bonds (272 kJ mol−1) so the degradation of natural rubber-based vulcanizates should involves mainly breaking of the C–S linkages . The degradation of cross-links (breaking of C–S and S–S moieties) will be connected with decreasing of cross-link density as a result of increasing of molecular weight of rubber chains between cross-links. The results of FTIR investigation were not confirmed that thermo-oxidative degradation of vulcanizates occurs, which is good correlation with obtained values of cross-link densities of obtained vulcanizates. It should be also pointed out that crosslink density values based on the Flory–Rehner model corresponds with the variation of torque difference (ΔM)—the relationship between both parameters is presented in Fig. 7. The increasing of ΔM is connected with increasing of cross-link density, which was also observed by other authors . 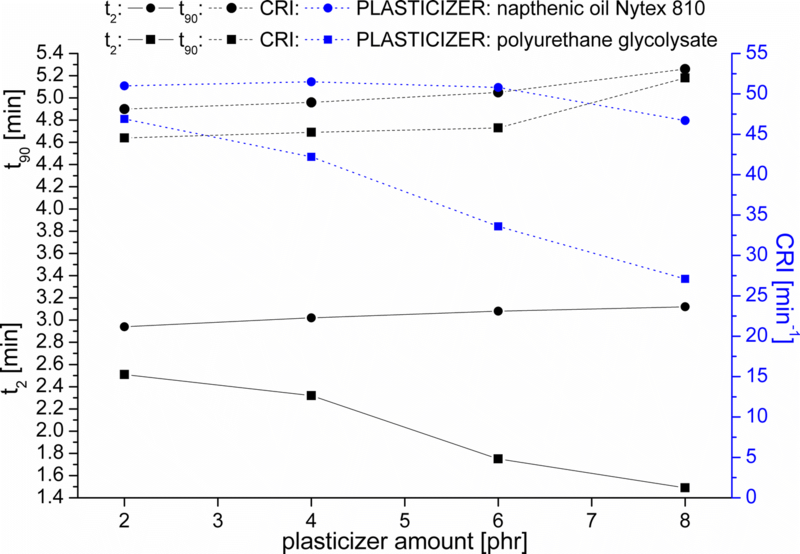 The higher values of cross-link density was generally observed for the vulcanizates obtained using naphthenic oil in comparison to vulcanizates obtained using polyurethane glycolysate contained the same amount of plasticizer, but increasing amount of plasticizer in the case of materials contained polyurethane glycolysate resulted in lower decreasing of cross-link density and difference between maximum and minimum torsion moment. At the maximal applied amount of plasticizer (8 parts per 100 parts of natural rubber) both materials have similar cross-link density. The temperature dependence of storage modulus (E’), loss modulus (E’’) and damping factor (tanδ) for non-aged natural rubber/carbon black vulcanizates prepared using polyurethane glycolysate as a plasticizer is presented in Fig. 8. It is clearly visible that increasing amount of plasticizer caused increasing of storage modulus and loss modulus. The increasing of maximal values of storage modulus at glassy region can be resulted from the reinforcing effect of introduced polar plasticizer (glycolysate chains contain polar groups, which can interact by hydrogen bonds). It is also possible that interpenetrating polymer networks (IPNs) between the rubber and polyurethane glycolysate were formed. The damping factor (tanδ) is defined as the ratio of loss modulus to storage modulus and indicates energy dissipated by various processes, like for example molecular mobility or breakdown of the filler particles. The dependence of Tg and tanδ at Tg (tanδmax) values from the cross-link density of obtained materials is presented in Fig. 9. The values of glass transition temperature and damping factor decreasing with increasing amount of applied plasticizer, which is connected with higher mobility of polymer chains resulted from lower cross-link density. The temperature dependence of storage modulus (E’), loss modulus (E’’) and damping factor (tanδ) for aged natural rubber/carbon black vulcanizates prepared using polyurethane glycolysate, in the amount 2 and 6 parts per 100 parts of natural rubber, is presented in Fig. 10 and Fig. 11, respectively. The maximal values of E’, E’’ and tanδ are higher for the materials aged for 7 days in comparison to the reference materials (non-aged). When the aging time increases and post-curing effect occurs the values of the storage modulus and glass transition temperature should increasing as a result of the cross-link density increasing . 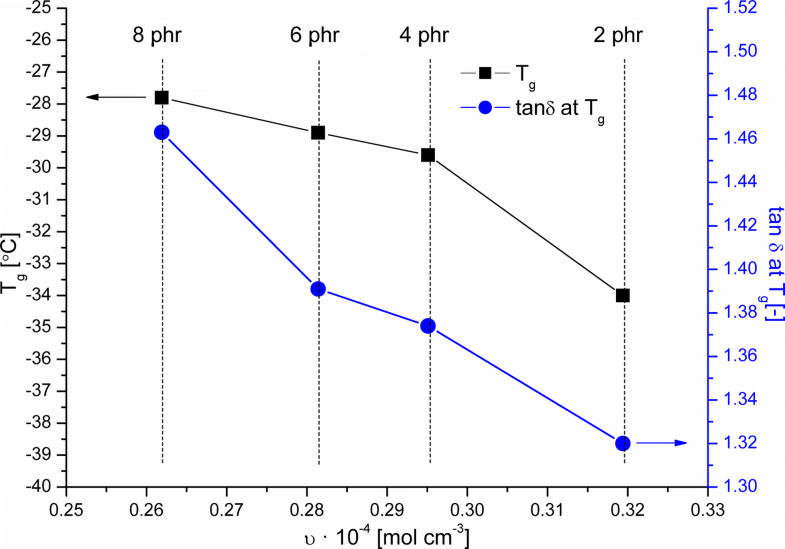 In the obtained results the glass transition temperature decreased after 7 days of aging, which suggest that the mobility of polymers chains increased, so it is in the opposite to the trend described in the literature. This fact can be connected with the changes in the microstructure of material, for example migration of the polar plasticizer between rubber chains, which improved their mobility. The values of mentioned parameters are slightly lower for the vulcanizates aged for 14 days in comparison to values obtained for materials aged for shorter time, which is probably connected with slightly lower increasing of cross-link density during another 7 days of accelerated thermal aging. The lowering rate of cross-link density increasing suggest that the cross-link density is near the critical value, so materials have quite similar properties. The decreasing of E’max, E’’max and tanδmax was observed only for the material NRC2G subjected to the accelerated thermal aging for 14 days. Probably after 7 day of aging the cross-link density reach the critical value, so further increasing of this parameter was impossible. As a result the degradation of rubber network occurs (e.g. chain-scission), which is confirmed by decreasing of cross-link density (Table 4). The selected mechanical properties (i.e. tensile properties and hardness) for obtained natural rubber-based composites are summarized in Table 5. Generally, tensile strength, elongation and elongation at break decreasing with increasing amount of plasticizer and increasing time of aging. The higher values of tensile strength were observed for the materials obtained using naphthenic oil as a plasticizer, while the higher values of elongation at break were observed for the vulcanizates obtained from rubber compounds plasticized using polyurethane glycolysate. This trend is connected with the cross-link density of materials, which was higher in the case of NRCO vulcanizates. The higher stability of mechanical properties during accelerated thermal aging was observed for NRCG vulcanizates. The obtained results also suggest that due to presence of urethane groups in the chemical structure of glycolysate chains they can act as antidegradants. The improved stability of NRCG vulcanizates can be also assigned to the formation of interpenetrating polymer networks (which can be also attributed to the increasing of storage modulus at lower temperatures in the DMTA results) between the rubber and polyurethane glycolysate. Only in the case of NRC2G materials the decreasing of mechanical properties was significant, which can be connected with the fact that cross-link density of this material reach maximum value in shorter time than in other materials from this group, so the degradation of rubber network (by e.g. chain-scission) dominating over the post-curing effect of vulcanizates. Modulus at 100, 200 and 300%, and hardness decreasing with increasing amount of plasticizer, while increasing time of aging resulted in increasing of mentioned parameters. It is resulted from decreasing of cross-link density with increasing amount of plasticizer (decreasing of material stiffness), and increasing of this parameter during accelerated thermal aging (post-curing effect). In the presented work polyurethane glycolysate (obtained by glycolysis of polyurethane foam using 1,4-butanediol) was proposed as a new plasticizer for the preparation of natural rubber-based composites. The influence of obtained chemical recycling product on the selected properties of rubber mixtures and composites was investigated and compared with commercial plasticizer (naphthenic oil). It was found that proposed plasticizer acts also as a vulcanization accelerator (decreasing of curing rate index). The optimal content of polyurethane glycolysate during the preparation of natural rubber/carbon black composites is in the range from 4 to 6 parts per 100 parts of natural rubber. The mechanical properties (like hardness and tensile strength) after accelerated thermal aging (70 °C, air, 7 and 14 days) of NR/carbon black composites obtained using glycolysate are higher than in case of similar vulcanizates prepared using napthenic oil as a plasticizer. It can be resulted from the fact that the urethane groups presented in the glycolysate chains can act as an antidegradant during the accelerated thermal aging in air atmosphere (thermo-oxidative aging). Moreover introduction of polar substance, like polyurethane glycolysate, is connected with the formation of hydrogen bonds (between the chains of glycolysates) and interpenetrating polymer networks between the rubber and glycolysate chains. The use of polyurethane glycolysate as a plasticizer for natural rubber is one of possible way for polyurethane waste recycling. It is beneficial from the environmental point of view due to reduce of polyurethane waste amount in the landfill. The presented results shows that a polyurethane glycolysate can be competitive plasticizer for the preparation of natural rubber/carbon black composites.